Cover the best of Philippines capital Manila over just 3 days! Most travellers think of remote islands and sun-drenched beaches when they travel to the Philippines and the Manila as just a transit. But there are many attractions to see and things to do in the historical capital city if you know where to look. Start your day early with a visit to the walled city of Intramuros. Locals still live within the area and you can hire a trishaw for the day to bring you around but do negotiate and agree on the price and time duration before you hop on. If possible write down the price on a piece of paper or you might get hassled for more money later. The kalesa (horse-drawn carriage) ride is also a novelty among tourists. There are many ancient buildings and historical sites dating back to the Spanish colonial era within the walled city and you can easily spend the whole day there. Fort Santiago is the major attraction at Intramuros. There are also several churches within the walled city with the oldest being San Agustin Church built in 1607 and recognised as a UNESCO World Heritage Site. The other church worth visiting is Manila Cathedral. Within Intramuros are several museums including Bahay Tsinoy, which documents the history of Chinese immigrants in the Philippines, the Archdiocesan Museum of Manila which showcases the history of the Catholic Church in the country, San Agustin Museum which is located within the church and Casa Manila which depicts how Filipinos lived during the colonial era. If you’re hungry, dive into Barbara’s Heritage Restaurant within Intramuros for lunch in a nostalgic setting. Nearby Intramuros, you can visit the National Museum if you can’t get enough of history. Another nearby attraction is Manila’s Chinatown, said to be the world’s oldest Chinatown. While you are there, go for a meal at Original Sa Lido Restaurant, one of the better-known restaurants in Chinatown. If you enjoy seafood, head towards Dampa seafood market for their fresh catch at reasonable prices. Admittedly, most parts of the city may appear gritty, but there is a newer area called Makati which is considered tourist-friendly and filled with high-end shopping malls, hotels and restaurants. Greenbelt, which opened in 1991 within Makati, is one of the flagship projects of Ayala Corporation. The mall has several high-end retail shops, restaurants and other leisure and entertainment options. The mall is connected to the park via covered walkways and you can enjoy a leisurely stroll to discover the chic cafes around the area and the Santo Niño de Paz Chapel, also known as Greenbelt Chapel, located at the Greenbelt Park. If you are an early riser, visit the Salcedo Morning Market for a huge selection of local foods. Another part of the city worth exploring is Bonifacio Global City or BGC which was formerly part of the military base. BGC is now a financial and lifestyle district with several shopping areas like the Forbes Town Center, McKinley Hill, Heritage Park and more. If you prefer a more local feel, head to Divisoria, a flea market with outdoor makeshift stalls located right in the heart of the city. Locals throng the market for its wide range of low-priced items like clothes, household necessities and so on. There are also street shops and malls surrounding the area. You can wrap up the day by heading over to Manila Bay to catch the sunset. The seafront promenade located directly opposite SM Mall of Asia takes on a carnival atmosphere at dusk but it can get crowded on weekends. A ride on the MOA Eye ferris wheel is recommended as you can get a good bird’s eye view of Manila Bay in air-conditioned comfort. For a short getaway outside the city, head towards Anvaya Cove Beach and Nature Club (anvayacove.com) which is located around three hours (176km) west of the city. Besides watersports such as sailing and boat rides to explore the nearby islands, the beachfront resort also has a great golf course. 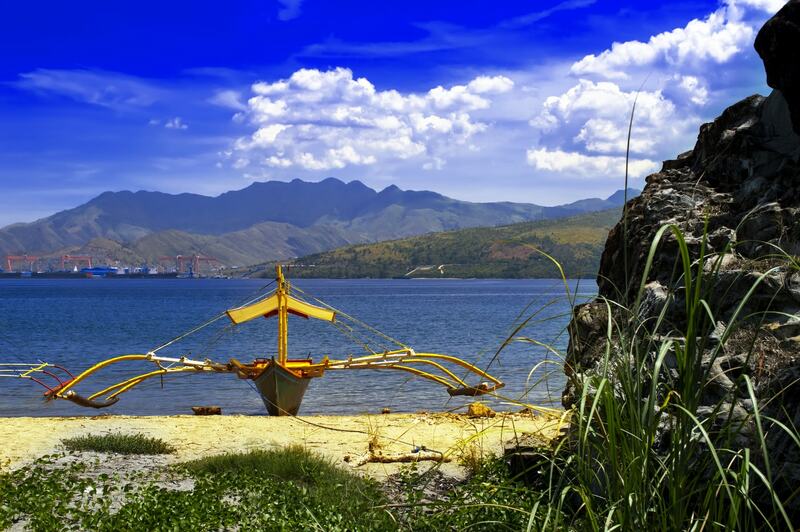 Along the way you can check out Subic Bay, the former site of the US Navy, now popular for its many theme parks and family-friendly attractions. Hidden Valley Springs Resort is another interesting place for a day trip to enjoy nature and a dip in the natural hot springs. If you prefer family entertainment within the city, check out the Manila Ocean Park, an 8,000-square-metre oceanarium located just behind the Quirino Grandstand at the Rizal Park. Rizal Park, also known as Luneta Park, or simply Luneta, is an urban park where the country’s national hero, Jose Rizal, was executed by the Spaniards in 1896. It was this historical event that led to the Philippine Revolution which resulted in the Philippines gaining independence from Spain in 1898. Manila has undergone many upheavals over the course of history and has emerged proud and victorious. No stranger to hardship, the chaotic city is currently re-inventing itself in a bid to catch up with the rest of Asia. There are now many luxurious hotels, modern shopping malls and entertainment facilities for tourists. Stay within the safe zones, avoid the seedy areas and you will have an enjoyable stay in the busy metropolis.